Style 7201 is made from silk chiffon in beautiful ombre colors such as royal, pink, and purple. 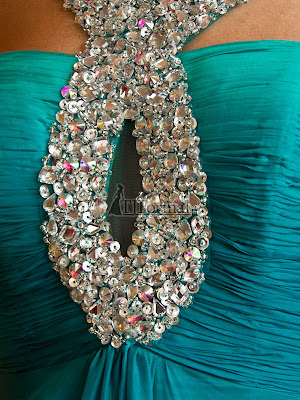 The bodice is embellished with a sparkling keyhole halter top encrusted with stones. The photos do not do this dress justice! It's a great fit for just about any size and looks elegant on everyone. Proms are coming up and there isn't a lot of time for the long wait of a dress that is not in stock. If you are scrambling to find a great dress and get it quickly...No worries! We have many sizes and colors IN STOCK in the store for Sherri Hill 7201. This means that once you order, this dress gets shipped to you the same day! Did you just get asked to prom and it's in a week? We can get this dress to you. Order online or call us toll-free: 1-877-769-1336 and start looking forward to your prom! This is great! I LOVE This dress... the royal is so striking. I ordered this dress and can't wait to wear it!! I just saw this in person and I love the beading and the AB stones incorporated into it. Stunning!